“The hot-headed young D’Artagnan along with three former legendary but now down on their luck Musketeers must unite and defeat a beautiful double agent and her villainous employer from seizing the French throne and engulfing Europe in war” (GSC Movies). Verdict: I paid to see how bad it turned out to be and I was left disappointed – it’s not the worst English film I’ve seen this year. However, it is probably the worst interpretation of the classic novel. Director Paul W.S Anderson either has no other tricks besides the ones he’s shown on the Resident Evil film franchise or, he thought he could just let Milla Jovovich‘s hotness take over his movie again. 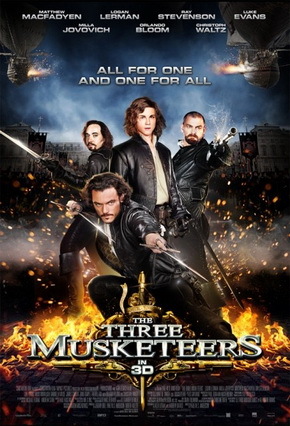 The Three Musketeers is quick-paced and action-packed but full of cliches and corny lines. Smart to incorporate steampunk elements but failed to make it count. It’s such a profit-driven film that nothing really comes to life and some scenes are just plain stupid. Corniest scene: (SPOILER BEGINS HERE) “Can’t you see we’re trying to have a conversation here?” says D’Artagnan (Logan Lerman), flirting with Constance (Gabriella Wilde) while fighting (SPOILER ENDS HERE). Airships: The flying ships in the movie reminds me of Final Fantasy, the RPG video game series. I wonder if it was influenced by it. To watch in 3D? I wouldn’t recommend watching the movie at all. Sequel? The ending does suggest so. If it happens, I’d expect more steampunk action than this installment and hopefully more of Gabriella Wilde‘s beauty. Second opinions: “Horrible… acting” (Josh Chow). “Well at least it’s way better than The Sorcerer and the White Snake” (Tham Ze Xin). oo. The banner looks good though. lol!